Boasting an excellent product, superb equipment, state-of-the-at facilities, professional and conscientious staff and an abundance of experience, this Claudy, County Derry headquartered operation ticks all the boxes. We got an insight into the history and current well-being of the business from proprietor Gareth Robinson. Established in 1951 by Matthew Robinson to fulfil the need for agricultural, housing and road development following the Second World War, Robinson Concrete has developed from its humble origins in Claudy and Dungiven to become the premier supplier of a full range of concrete products across counties Derry, Donegal, Antrim and Tyrone - from Ballymena to the tip of Malin Head. Throughout the decades, this proud family business - now in its third generation - has maintained the ethos of ‘Quality, Service, Value’ throughout all of its operations and prides itself on being at the very forefront of the concrete products market in the North West. 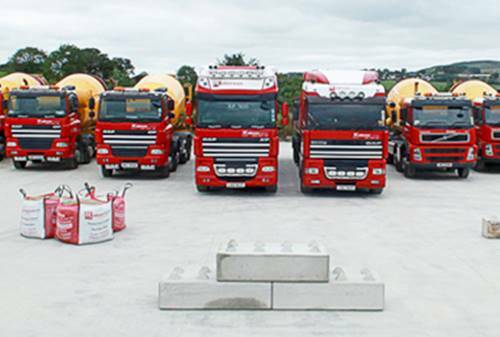 Robinson Concrete comprises two depots strategically located in the North West of Ireland. The Claudy depot – which boasts its own sand & gravel pits - services Derry and North Donegal areas from Benone to Carndonagh, while the Ballymoney depot provides coverage across the North Antrim coast from Coleraine to Cushendall and further inland from Garvagh to Maghera. Both depots are equipped with facilities for the collection or delivery of ready mixed concrete, blocks, sand & gravel, decorative stone, screed, aggregates, cement, mortar and landscape products. Robinson Concrete offers more than sixty years of expertise in pre-mix concrete production and supply, enabling them to provide a top-class product and service, supplying the agriculture sector predominantly but also providing raw materials for house construction, road projects etc. They use their own extensive reserves of sand & gravel as well as premium, locally-sourced quarry stone to manufacture the highest-quality pre-mix concrete. A fresh and immaculately-maintained fleet of vehicles ensures rapid delivery across the four counties, including specially-tailored mix designs to suit each individual residential, commercial, agricultural or domestic job. Concrete blocks are manufactured at Robinsons’ Claudy depot using locally-sourced aggregates to produce a consistently high-quality product. These blocks are stocked in both the Claudy and the Ballymoney depots, ready for collection or delivery. Deliveries are made using either rigid eight-wheel crane lorries or an articulated lorry with a rear-steer crane trailer. Selecting only the best vehicles to transport their cargo, Robinsons purchased a brand-new Euro 6 DAF CF rigid chassis from TBF Thompson earlier this year to handle pre-mix concrete. Conceived to offer a performance-driven truck with low-running costs, the FADCF440 combines DAF Trucks’ latest innovations with valued engineering techniques. Powered by an all-new 11-litre Paccar MX engine, the DAF’s driveline is both light and compact, ensuring high payloads through low unladen weight. An all-new front wheel and Stabilink rear suspension systems give the truck excellent balance, stability and rigidity when in motion, while the Y-frame profile also benefits the CF by providing extra space for a large radiator, improving engine cooling and reducing excess fuel consumption. Robust exterior components like the galvanised steel bumper, large grille, mud flaps and side skirts are cleverly blended into the truck’s stylish aerodynamic bodywork, optimising air flows and reducing drag. Robinson Concrete’s newest CF joins a number of DAF trucks already hard at work in their exceptional 22-strong fleet. “As well as the 22 trucks, we have 16 cement mixers and we run a few demountables, which switch between block lorries and mixers,” Gareth points out. “Around 80% of the fleet would be DAF at the moment; the rest are Volvo. “We’ve also recently upgraded our workshop into a state-of-the-art, high-tech facility with the addition of a new pit, testing lane and brake testing facilities to facilitate our in-house fleet maintenance and six-weekly checks. We have our own mechanics and technicians on hand to maintain, service and repair all the equipment including the plant – loading shovels, forklifts, excavators, dump trucks, block-making equipment etc. Speaking of quality, at the time of writing, Robinson Concrete was undergoing third-party accreditation with a view to securing BSI Third Party Accreditation for their concrete by the end of August, 2015. Everything is done in-house, with no aspect of the business outsourced or subcontracted. Thus, Robinson Concrete maintains complete control of its own destiny. They employ all their own staff (30 people at present), deliver all their own products, own their own trucks and equipment, and therefore have clear lines of communication with their customers. “One of our biggest assets is our staff and we are very lucky in that a lot of them have been here a long time and they are an important part of that vital link between customer and company,” Gareth adds. Of course, there is no room for complacency. Looking to the future, Gareth intends to keep the shoulder to the proverbial wheel: “We will continue to do what we do to the best of our ability and hopefully the market will rise a bit,” he concludes. “We’ll keep the product line simple, keep investing, and do our very best. “This hasn’t been an overnight success story. We have grown over a long number of years by focussing on our core business and hoping that people would like what we do and want more of our product. Our expansion has been purely demand-driven.